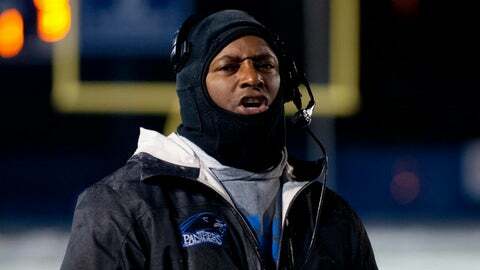 Eastern Illinois Panthers head coach Dino Babers stands on the sidelines during the second quarter against the Towson Tigers at O'Brien Field. Dino Babers spent almost three decades as an assistant coach before getting to sit in what he calls "the big chair." Now that he’s made it, and now that he’s taking over the chair at Bowling Green, there’s no going slow. "There’s no time for it," Babers said. "We’re going to be up tempo. We’re going to be fun." There are worse things for new coaches to promise, and Babers makes that promise with confidence. Through 27 years as an assistant — some jobs better than others, some in more glamorous spots than others — Babers had prepared himself for the opportunity he first got in 2011, when he left Baylor to become head coach at Eastern Illinois. That, too, was fast. His teams went 7-5 and 12-2 in two seasons at Eastern Illinois — that job opened after back-to-back 2-9 seasons in 2010-11 — and earlier this month, he was hired at Bowling Green after Dave Clawson left for Wake Forest. At Bowling Green, the 52-year-old Babers sees the chance to go even faster. He watched from home Dec. 6 as Bowling Green beat then-unbeaten Northern Illinois to win the Mid-American Conference title, and fewer than two weeks later he was addressing the Falcons players as his own. He’ll just be an observer as Bowling Green plays Pitt in the Little Caesar’s Bowl Thursday night, but as soon as that game ends, he officially becomes the CEO. And he’ll be emphasizing MPH. I can’t make a bunch of promises. I can say we have a good thing going and we’re going to play a fun brand of football. "I have to do what I believe in," Babers said. "I’ve been in a lot of football rooms. I’ve coached in a Don Coryell, San Diego Chargers vertical stretch (offense). I’ve been in a West Coast Offense, the Bill Walsh stuff. But the Art Briles, Baylor offense is something I’ve never seen." So, the Baylor offense it is at Bowling Green. It’s an offense that posted 49 points in Babers’ first-ever game as a head coach, and this season it’s an offense that led all FCS schools at better than 48 points and 589 yards per game this season. And with quarterback Matt Johnson just completing his sophomore year, it’s an offense that should keep Bowling Green at or near the top of the often wide-open MAC, though Babers’ goals might stretch beyond that. "I always tell players, ‘Don’t put ceilings over your head or put walls around you,’" he said. "I don’t know how good we can be. Let’s go to work and see where we can take it." The Briles-Baylor offense took off with Robert Griffin III at quarterback and Babers coaching a receiving corps that included, at various times, Kendall Wright, Terrance Williams and Josh Gordon. Just when Babers thought he might be "losing the egde" in regards to his head-coaching dreams, Eastern Illinois called. Upon his arrival, he found a quarterback there in Jimmy Garoppolo who not only embraced the tempo of the offense but was gifted enough to help take it to another level. Now, Babers calls Garoppolo the "second-best QB I’ve ever been around" besides Griffin and saw every NFL team visit Charleston, Ill., this season for a longer look. "Just an evaluation miss by Div. I (FBS) schools," Babers said. "I saw him make about five throws and I knew he belonged at a higher level." Getting Bowling Green to a higher level becomes Babers’ focus now, and even as the game has changed and these up-tempo offenses are very much en vogue, Babers points to a quote from legendary coach Bud Grant he cut out of a newspaper in the 1980s. "You’ll see it in my office," Babers said. "It says, ‘To be a big-time football coach, you have to have three things: Agreat wife, a great dog and a great quarterback — and not necessarily in that order. "Don’t get me wrong: I’ll take a great defensive line some corners who can cover, too. But if you’re going to play with the big boys, you need a good quarterback." With Johnson, he’ll have that. He has solid players at lots of other positions, too, and that’s why this is an opportunity Babers had circled before Bowling Green ever called. "If you look at the football team, it’s a champion," Babers said. "So many coaches go in at the bottom and are working to rebuild. Now, if you don’t win, people are going to wonder why. And that’s fine. They should. "I can’t make a bunch of promises. I can say we have a good thing going and we’re going to play a fun brand of football. We’re going to be a program that strives to be consistently good. Consistency breeds winning. Consistency is something you can wind your clock by." Babers plans to keep that clock winding as fast as possible. He waited a very long time for this.